You are currently browsing the Free Templates Blog blog archives for June, 2010. 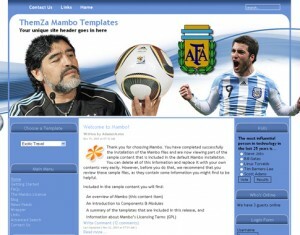 Check out the latest World Cup 2010 Mambo templates by ThemZa.com. Only the best teams made it to the finals, so pick a theme for your favorite and show your support in the most crucial moment, where every friendly ‘Go go’ exclamation matters. Check out the new football themes just now added to the quickly growing ThemZa.com collection of Mambo templates, just in time for the World Cup football season! The World Cup 2010 Joomla 1.5 template, coming out at the end of the week, will help you set up your favorite team’s dedicated portal site in a click! The World Cup 2010 Joomla 1.5 template out now. Hurry up and download this hot world cup template with a click from ThemZa.com. Check out the hottest World Cup 2010 templates for Mambo based news portals, weblogs, and community portals, etc., now ready for free download on ThemZa. Follow all the happenings and big scores around the hottest public event of the year with the World Cup 2010 Joomla 1.5 template. The Island Holidays Joomla 1.0 template is now free to download for your tropic holidays travel guide or reservations portal. Don’t miss out on it. Check out this academic style theme for your Moodle-based site. Present online your e-university programs for Bachelor’s, Master’s or Doctoral degrees. The new Gym Practice Joomla 1.5 template, now downloadable for free from the ThemZa site, will perfectly fit your online portal for body building practices and accessories. 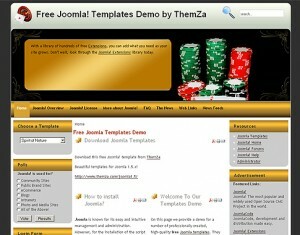 The Casino Royale Joomla 1.5 template is now online with a gambling touch and lively colours. Check it out!